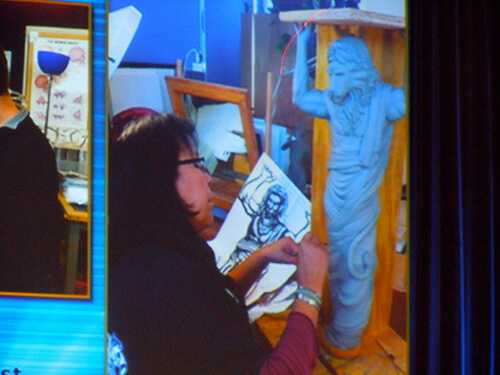 At Destination D: Walt Disney World, attendees were treated to a first look at new imagery and details for the New Fantasyland expansion at the Magic Kingdom during the “Imagineering Walt Disney World” presentation. 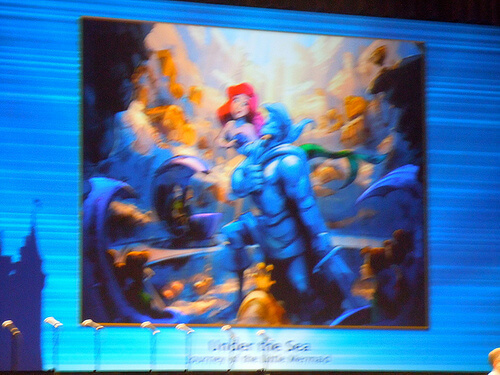 Included in the presentation were images of models, sculptures, and concept artwork from the expansion that’s currently being added to the Magic Kingdom. Featured were the Be Our Guest restaurant, interactive Belle meet-and-greet, Storybook Circus, and the Seven Dwarfs Mine Train ride. 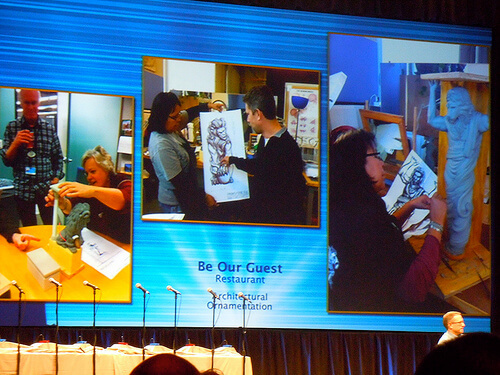 Imagineer Chris Beatty walked the audience through the plans to enhance Fantasyland. When entering the New Fantasyland, a castle wall begins the story, separating the castle courtyard from the rest of the new Fantasyland Forest. Beyond that wall will lie all of the new additions to the Magic Kingdom, including the Be Our Guest restaurant, Maurice’s cottage featuring an interactive Belle meet-and-greet, the Seven Dwarfs Mine Train coaster, and The Little Mermaid ~ Ariel’s Undersea Adventure. The location of the New Fantasyland is important, as it’s being built beyond the underground “utilidor” tunnels of the Magic Kingdom, allowing Disney to add more trees, waterfalls, and other “over and under” elements. Unlike the Disney California Adventure version of this attraction (which opens in just a couple weeks), the Magic Kingdom ride will be contained in Prince Eric’s castle. 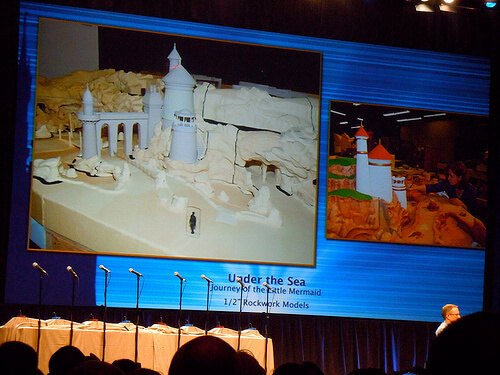 A model of this castle was shown at Destination D, featuring large waterfalls and lots of bridges. 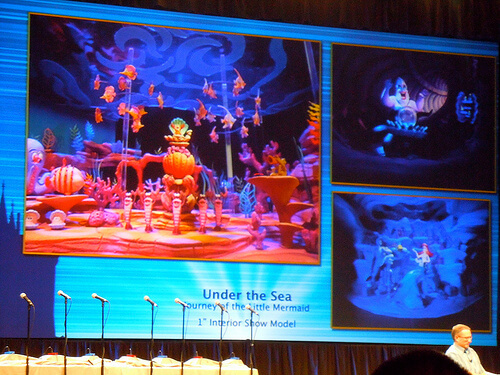 The massive “Under the Sea” scene was said to be 2/3 the size of Haunted Mansion graveyard scene. 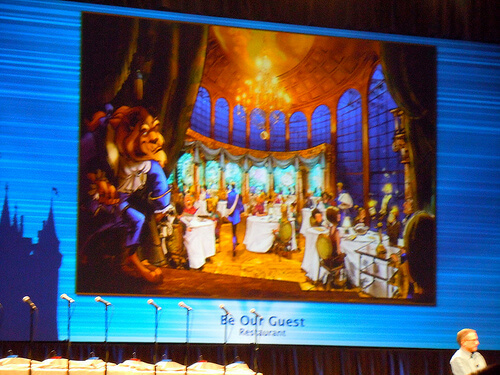 The Be Our Guest restaurant, inspired by Beauty and the Beast, will feature 3 dining rooms. The main dining area is the ballroom, at two stories with a special snow effect year-round in the large glass windows. 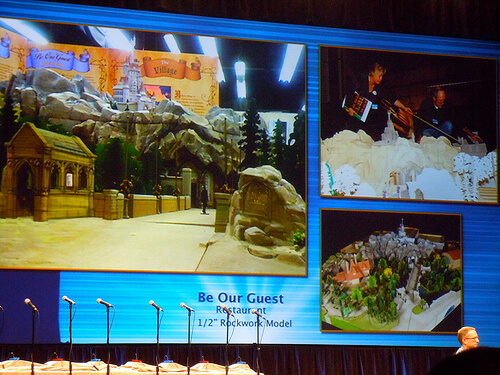 The other dining rooms will be Beast’s gallery and the foreboding West Wing of Beast’s Castle. The whole area approaching the restaurant will be foreboding, featuring gargoyles and waterfalls. Maurice’s cottage will be the place to meet Belle, during an elaborate 40-minute experience called Enchanted Tales with Belle. 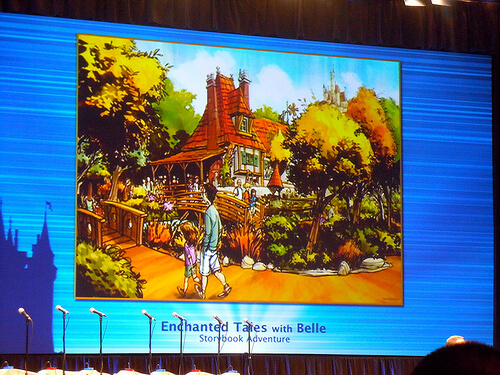 It’s one of Disney’s new “Storybook Adventures” that will allow guests to spend more one-on-one time with characters. Stepping into Maurice’s workshop, guests will find plenty of gizmos lining the walls before a magical effect transports them from there to Beast’s Castle. It’s a special magic moment that Imagineers did not reveal today. From there, guests will come face to face with an animatronic wardrobe before meeting Belle herself. 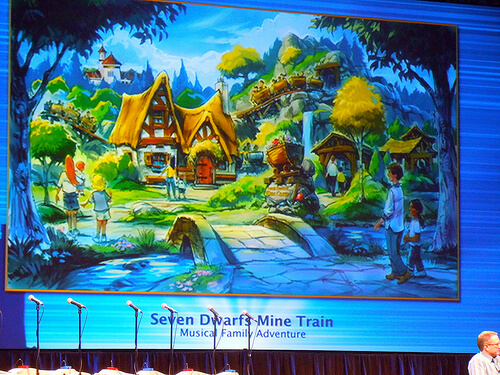 No new artwork was shown today for the Seven Dwarfs Mine Train but more details were revealed. 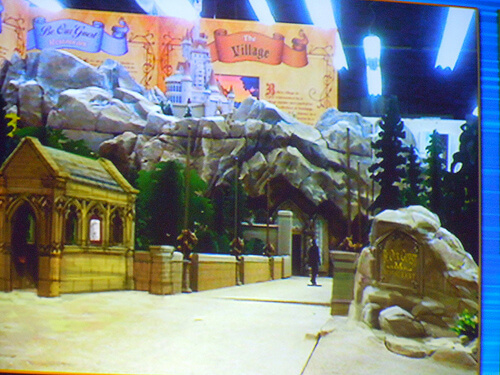 Guests will start inside a cottage, travel into the mines in a dark ride fashion, and then back out. The ride, which will be more intense than the Barnstormer but less than Thunder Mountain, will feature 2 lift hills and 2 run outs, with the second lift hill being inside the mine. 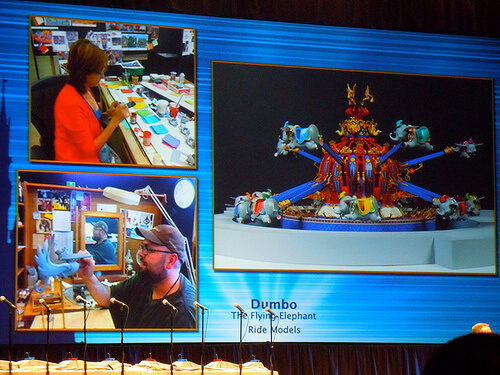 The “double Dumbo” that will be part of the Storybook Circus part of the New Fantasyland will feature the same classic Dumbo ride vehicle design but with a new color palette and style for the carousel. At the top will be storks and at the bottom will be 8 panels telling the story of Dumbo. The New Fantasyland will open in phases beginning in late 2012. Thanks so much for sharing, Ricky! Reading this has me even more excited for the expansion. Definitely excited about having Disney focus more on the movie aspect of Beauty and the Beast, and less of the girly “princess” approach they usually take with the movie. Oh, so (shh!) Be Our Guest won’t actually be inside the Beast’s castle–which is too small anyway–we’ll be in that big rock formation? I’m so excited about the ‘Be Our Guest’ restuarant!! The whole expansion looks wonderful and the Dumbo expansion was LONG overdue. Any word on Mickey and Minnie’s house? Staying or being demolished? The houses have already been demolished. I wish there was a Rapunzel Tower somewhere. Rapunzel is my favorite princess because I kind of look like Flynn Rider a little and because Rapunzel was a funny story that was made much better by the movie Tangled which was silly and exciting. If they built a Rapunzel Tower I would climb it and then my friends back home would be jealous I got to meet Rapunzel. I forgot the name of the bug that Rapunzel kept as a pet but he was my favorite part of the movie for Rapunzel.